A work of functional art, this piece adds a cozy touch to your family-style supper. 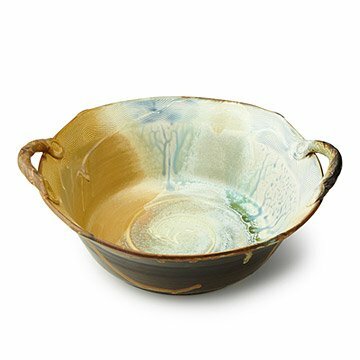 The sunsets, ocean, and redwood forests that make up his Pacific Northwest surroundings are potter Ansel Beck's muses for this handcrafted serving bowl. A work of functional art, this piece adds a cozy touch to your family-style supper. Lead free and food, oven, dishwasher, and microwave safe. Handmade in Arcata, California. With formal training and a bachelor’s degree from Columbus Collage of Art & Design, Ansel Beck Pottery has a standard of excellence. His aim is to create one of a kind functional art with a recognizable style. He does this by using subtle glaze effect combinations of brush work, pouring, or spraying. This allows the glaze to play on the surface texture of the clay through the magic of the firing. There is a conscious process of creating textures for the hand and the eye to appreciate. Creating ceramics inspired by English, Japanese, and American pottery, Ansel's goal is to create work that is both tactile and aesthetic, and meant to enhance your daily life. Living in the Great Northwest, Ansel is inspired by the colors of the sunsets, the ocean and the redwood forest, which are rich in warm and cool tones. As functional art, Ansel's work is lead free, food safe, oven safe, dishwasher and microwave safe. My daughter shares this serving dish with her family with pride. I plan on adding another Mother of Pearl Stoneware every opportunity for her so she may pass them on to her daughters. I bought this bowl for my daughter for Christmas, so it won't be used until then. However, it is VERY beautiful and VERY well made. I know that she will love it and use it for many different things.